The NewStar speaker mount, SPEAKER-W100 is a set of two speaker mounts to mount two speakers to any wall or ceiling. 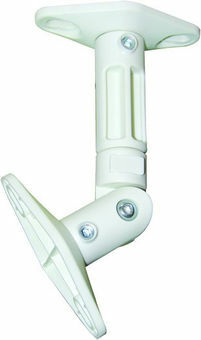 This mount is a great choice for space saving placement on ceilings or walls. NewStars’ tilt (180°), rotate (360°) and swivel (360°) technology allows the mount to change to any angle to fully benefit from the capabilities of the speaker. The mount is manually adjustable in height and depth. NewStar SPEAKER-W100 has four pivot points and is suitable for speakers up to 3,5 kilo. The brackets are easy to change from wall- to ceiling bracket.